PORTSMOUTH, Ohio -- With three of four returning members from last year’s regional champion, Wheelersburg High School again won the South Central Ohio Regional Science Bowl on Friday, March 9, at Shawnee State University. The Pirates repeated against 31 competing teams from 19 southern Ohio high schools. The team earned a trip to the National Science Bowl, which is scheduled for April 26-30, 2018, in Washington, D.C.
More than 150 southern Ohio high school students competed in the 2018 South Central Ohio Regional Science Bowl at Shawnee State University in Portsmouth, Ohio, on Friday, March 9. Participating schools besides Wheelersburg included Chillicothe, Eastern Pike, Green, Huntington Ross, Lucasville Valley, Minford, Northwest, Notre Dame, Pike Christian Academy, Piketon, Portsmouth West, Sciotoville East, South Webster, Unioto, Vern Riffe Career Technology Center, Waverly, Western Pike and Zane Trace. Wheelersburg finished 2-1 in morning pool play, which determined seeding for the afternoon single-elimination tournament. The Pirates then defeated Waverly, Green, Huntington Ross, Unioto and Notre Dame to win the event. Notre Dame was a two-time champion. Lewis was joined by senior Seth Pertuset, the newcomer to the group, and junior Aaron Bundy and sophomore Gus Shoemaker, who were on last year’s Wheelersburg team. The alternate was junior Quin Whitley. Lewis said it was a team effort with him and Pertuset being strong in math and chemistry, Shoemaker having strength in earth and space science and Bundy providing expertise in energy-related topics. The National Science Bowl is a nationwide academic competition that tests students’ knowledge in all areas of science and mathematics. Teams are comprised of four students, one alternate, and a teacher who serves as advisor and coach. The teams are quizzed in a fast-paced contest involving biology, chemistry, Earth and space science, physics, energy, and mathematics. 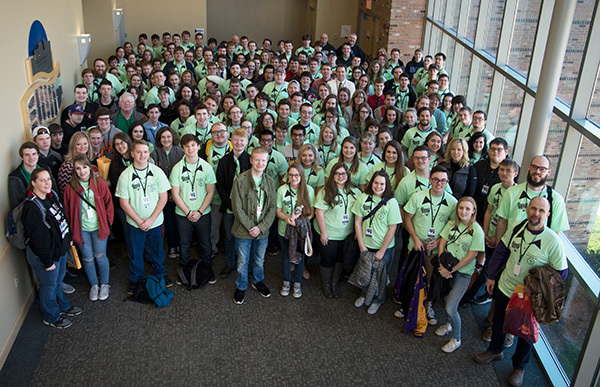 The South Central Ohio Regional Science Bowl is one of 64 regionals across the United States. More than 9,000 students will compete in the program with fewer than 350 reaching the national event. DOE’s Office of Science manages the NSB Finals competition. More information is available on the NSB website: http://www.science.energy.gov/wdts/nsb/.